I believe strongly in the work smarter, not harder mantra. In fact, when you study worker productivity it's interesting what the corollaries are. They're hardly ever intuitive. Contrary to what we might think, mindless internet surfing actually makes us more productive. What's interesting is that this company, SpectorSoft has developed a tool to make workers less productive but they sell it as making them more productive. Bizarro land. We're still never far from snake oil salesmen. There are several varying speculations out there about what makes people more or less productive at work, exercise sleep, coffee and creative play. Companies like Google often have "game rooms" and the like set up for their employees, the thinking being that their best thinking might come doing something completely not work related. In an effort to work smarter, not harder today's Friday Find is riding on the coattails of Full Pull Wines offering this week of the Kevin White wines. I first got to try the wines Kevin is making last year at a tasting with Sean Sullivan, and tasting them with several other Washington wines at the time his Syrah, En Hommage really stood out. It was floral, elegant and loaded up with minerality in a way that had it standing toe to toe with some of Washington's big names, and much, much bigger price tags. I took this picture that evening of my stand outs, I stand by that assessment to this day. 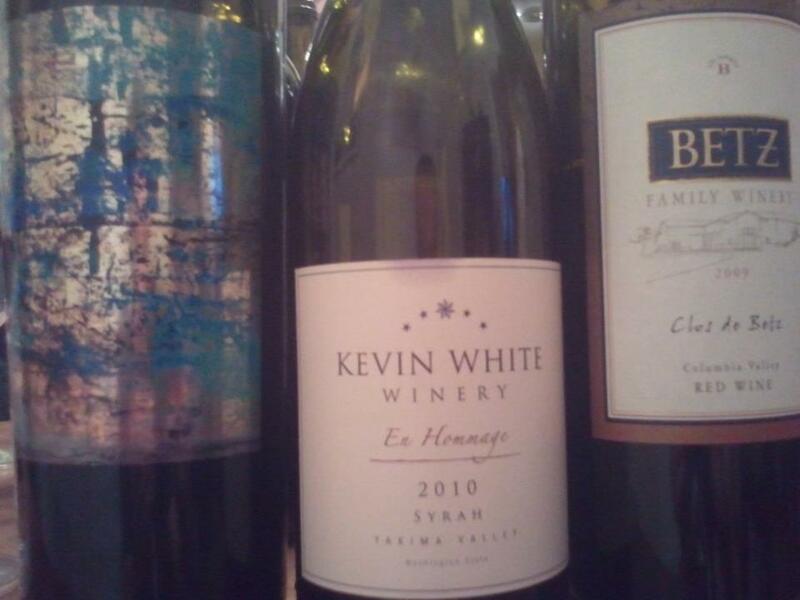 As you can see Kevin's Syrah is flanked by the Betz Cabernet and the Waters 21 Grams. These are bigger wines, both in flamboyance and in price. I thought the KW belonged in the shot if only because it distinguished itself in terms of elegance, acidity and fruit, much less oak and not quite as ripe and round as many of the other wines. Kevin's new releases just hit the street and they're as good, and there's two this time and not just one. The prices are still at $20 and under, which is absolutely insane for a wine this good, and there's so little of it. For Kevin it's about paying his dues, when I talked to him at Taste Washington this year and asked him about pricing his response was full of humility. "Well, I'm new, and nobody knows me yet, so it doesn't make sense to me to price the wines too high." The 2011 wines are well worth checking out and they're a steal. The deal is if Kevin keeps this up these won't always be under $20 gems. They're much more wine for the money than you'll get nearly anywhere, so get some. Get a bunch if you're the kinda person who buys wine a case at a time, but definitely get a bottle or two because you'll be supporting a good guy who's an up and comer. Kevin still has a day job. Check out the Full Pull Wines offer here to order yours.